Between long hours at the office and blogging there’s not much time to try new recipes for the family (or even cook dinner some nights). While I do enjoy cooking it’s definitely taken a backseat recently to try new things. So when preparing a dish for New Year’s I went with an old made-up concoction I’ve been cooking for years… I’ll call it my stuffed croissant appetizer! Preheat the oven to 375 degrees and lightly grease a cookie sheet. 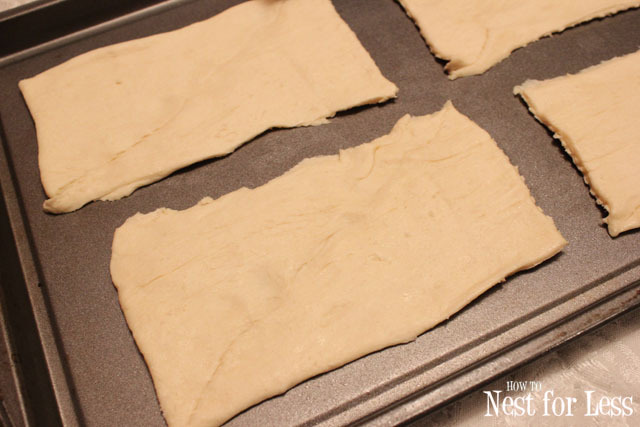 Spread out half your can of croissant dough into rectangles (the dough is perforated into triangles; just press the edges together to keep the rectangle shape). 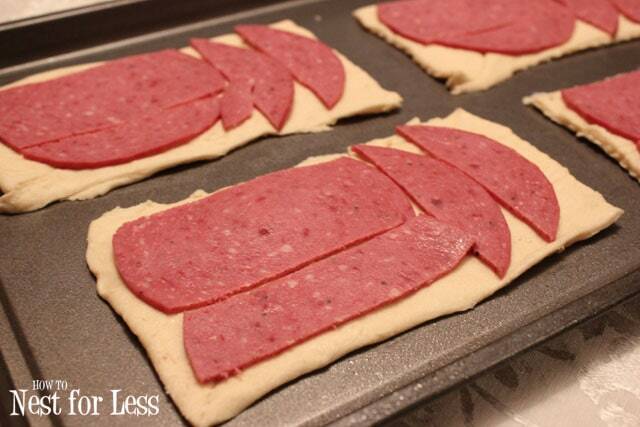 Cut the cotto salami and place on top of the croissant dough within the edges. 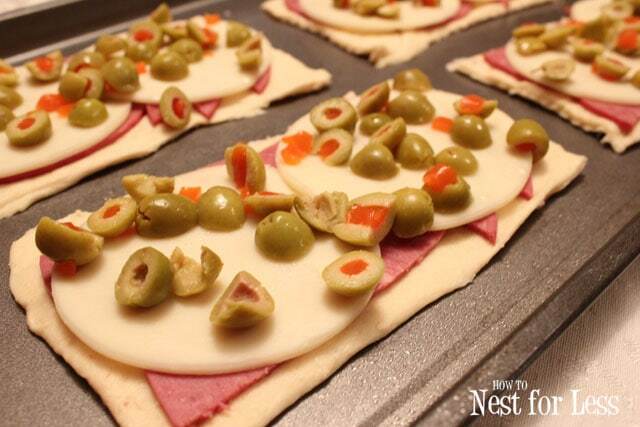 Next slice your provolone cheese and green olives and place on top of the salami. 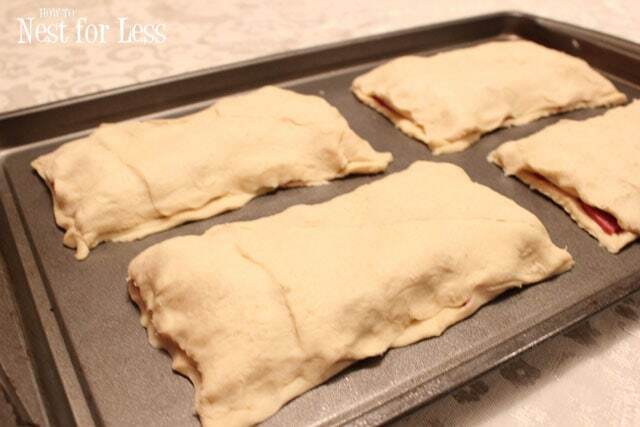 Take your remaining croissant dough and press the edges to seal in the ingredients. Bake for about 15 minutes or until golden brown. For easy slicing, just use a pizza cutter to trim into 1 inch wide strips! 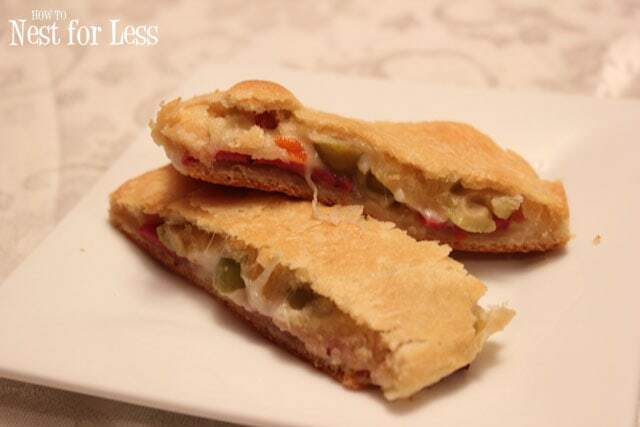 And that’s it… simple little appetizer with only 4 ingredients! First, this looks so tasty! Yay, another office worker! Urgh, it’s so hard sometimes to find the time and sanity to continue blogging while working & being a mommy/wife. I don’t know how you have the shop & craft shows on top of everything, too! YOU GO GIRL! I love this. Thank you for sharing. But can I ask if there another name of croissant in a can? I’ve never seen it in the UK. 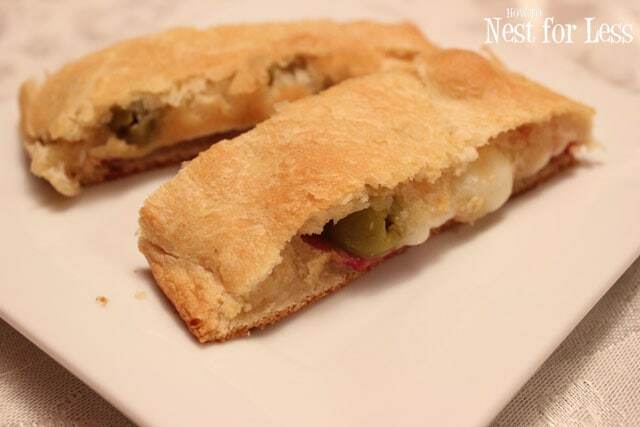 Is it similar to puff pastry at all? Puff pastry would work just fine! Any time of croissant dough or pastry dough that’s a little bit flaky. Hope that helps! Brilliant. I’ll have to make these! Look forward to following your blog. oh my these look so good! I can’t wait to make them! Thanks Chris! It’s a favorite with my family! Looks delicious! And easy 🙂 I love anything with crescents! oh that looks good, I would so just eat that as a meal!